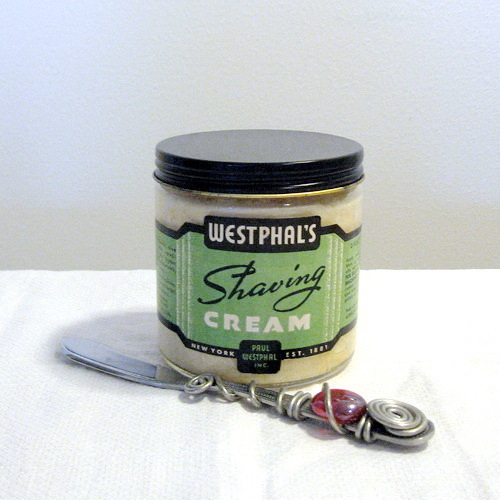 I have a one-pound jar of vintage Westphal's shaving cream that I'd like to pass on to someone else. It is an excellent old cream, making quite good lather that has a fresh green fragrance; I've just gotten kind of tired of it and have other soaps and creams I prefer. Probably 85% of the cream remains. This is the equivalent of 4 regular jars of cream. I'll happily package it and drive it to the Post Office, but I'm not feeling generous enough to pay for the shipping myself, so the recipient will have to cough up the $13 cost for Parcel Post or $14 for Priority. CONUS only. If no one claims this within the next week, it goes down the drain. Note: The knife in the image is not included.